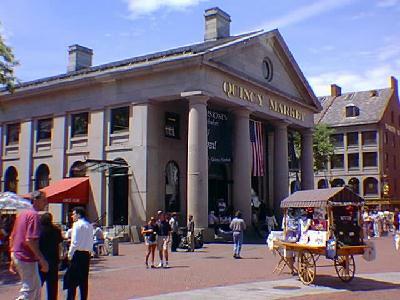 Quincy Market is such a strong sign of revitalization in Boston, that its earlier significance is easily eclipsed. This was the first major project initiated after Boston became a city. It established the city as able to structure its own development, and the mayor's office as a position for coordinating city planning and development. After several false starts, Boston finally incorporated as a city in 1822, and faced the challenges of growth into a metropolis. Once again food distribution was among the most pressing problems for the new city. While Faneuil Hall (pictured here behind Quincy Market) had proven to be a useful, its 14,000 square feet of space was no longer nearly adequate to support the City's nearly 50,000 residents. The response required was larger than any one individual could provide, and would have a sweeping impact on the city. 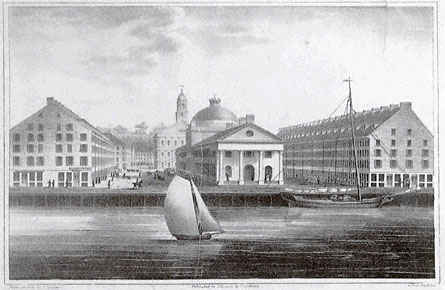 In a single sweep, Quincy Market enhanced city-life and commerce, caused the redesign and addition of six new streets, and established the City Docks in still deeper waters. In the next fifty years Boston would grow from around 50,000 to over 250,000 citizens. The market's lesson, that the City could facilitate opportunities for business and civic growth, would lead Boston to remake its self in even more bold ways. Built on the ocean's edge, Quincy Market's Ionic porticos with monolithic columns on each end, would have made a strong impression to those approaching by sea, or from the State House. The 535 foot long market concludes on both ends with monolithic columns supporting pediments reminiscent of Greek temples. The entry to the building is further enunciated by semi-circular windows above its large central doors. The white granite constitutes a structural facade, which would be freestanding without the brickwork used to separate merchant stalls inside. The Market is visually rhythmical and symmetric, with a feeling of order emanating from the street-like nature of the main promenade. 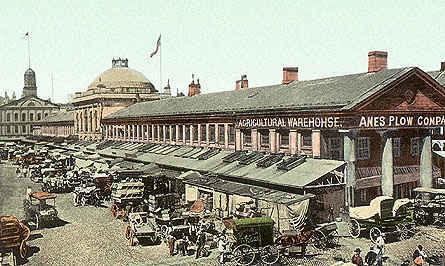 The market has a series of eight thin rectangular chimneys even distributed along the length of the building. At its center is a muted copper dome which rises above a small copper wall cornered with granite blocks. Between 1976 and 1978 the Faneuil Hall Marketplace was restored, and repurposed as a tourist destination and retail location surrounded by history. Architect Benjamin Thompson and Associates secured the commitment of the City and the financial commitment of the Rouse Company which has gone on to replicate this success in other cities. Contemporary additions to the building are complementary, but are visually distinct, providing the visitor with an accurate idea of the market's original form.